February 25, 2015 February 28, 2015 ~ Trevis Dampier Sr.
Getting back to my mission, I was running errands in Fremont,Ca during my lunch break and I saw all kinds of restaurants left to the right and right to the left. The temptation of stopping at a restaurant on this beautiful, California 75 degree day was overwhelming me. I was doing ok until to the right of me this bright light shined from a distance; there was a sparkling of a familiar looking sign that caught my eye. It seemed to call deep within me at first glance. As the brightness of the sun allowed me to focus on what was in front of me and I glanced to my right I saw the sign for Nation’s Giant Hamburgers. My heart began beating faster and faster and I continued to minister to myself. I made it to the stop light about a block away and darn it! ; it’s a red light. My leg was shaking at rapid pace and then the light turned green. What was to save me from this consuming seduction of possession I was feeling?! I could feel my arms reaching over each arm as if they had a mind of their own, “What am I doing.. I’m making a u-turn..” I said to myself. Once I shook hands with my spirit, body and soul, we were all in agreement to sink our fangs into a juicy Nation’s burger. My mind went back to why this place is significant in my soul…. Nation’s has been around a long time and when I grew up as a kid, my mom would take me and my brother’s there for breakfast to have their delectable pancakes, as a teenager I would go there and buy their juicy immense burgers myself, and every time my brother visits from Irvine,Ca twice a year we make sure to make it a family event by grabbing Nation’s burgers for all of the adults and all of our kids. Nation’s to me is a place where you can create family memories. When you walk in the atmosphere is a 1950’s diner theme that hasn’t changed since I was a kid and they keep the menu nice and simple and they stay original rather than trying to keep up with market fads. You can choose to have breakfast anytime that they are open and have a thick fulfilling milk shake to pair with that or you can pair that milkshake up with one of their fat juicy burgers with regular fries or chili fires. With that said, I haven’t bit into one of their burgers since my brother was visiting for a week during Thanksgiving so I’m definitely not going to waste this calorie indulgence on anything else today. 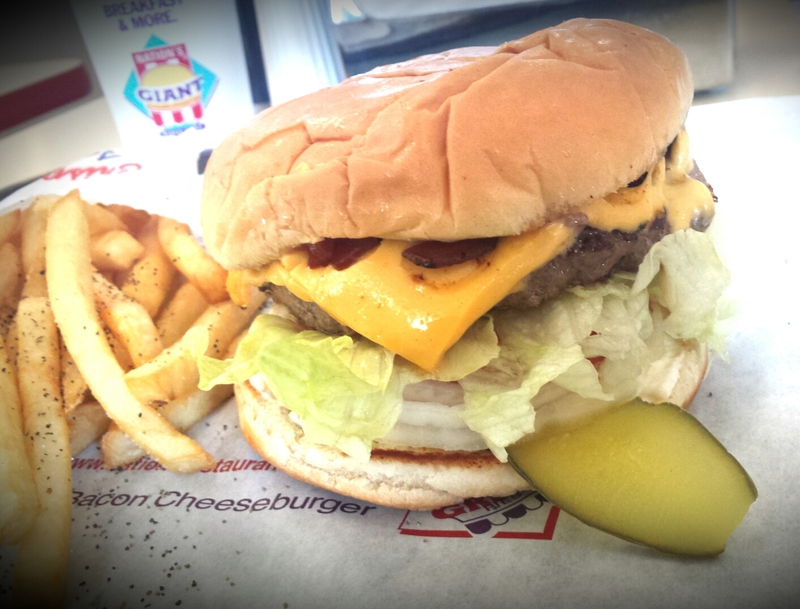 I step up to the counter with an amplified smile and order the Bacon Cheeseburger with everything on it, which includes grilled onions, tomatoes, cheddar cheese, sliced pickles and bacon of course! Standing from the counter you can see the chef flipping flat grilled burgers right in front of you. I can see the juices running down the sides of the patties while they sizzle on the flat grill top. Man this is exciting! I grabbed my seat and opened up this wrapped monument and it is everything I remembered. Childhood memories flash before me of smiles and chuckles with my brothers and I as kids and my mom smiling with us. I see the new generation of my family, my sons and nieces and nephews jumping for joy at the sight of Nation’s delectable fiddles in front of them. I open my mouth as wide as I can (trust me, it is the only way you can bite into it) and then sink my fangs into this enormous mouth watering thingamajig! Yummy! The beef is tender and savory, the cheese is melted perfectly , the lettuce is healthy and crunchy, the onions are sweet and grilled to perfection and to top it off, the tomato is fresh and plump! I keep biting and chewing and biting and chewing. Sip some soda. Chomp on some fries. Biting and chewing and biting and chewing until I reach my last bite. I feel subdued in satisfaction, I feel my soul was nurtured in love with family memories. I am truly satisfied. That is what live action eating is all about! 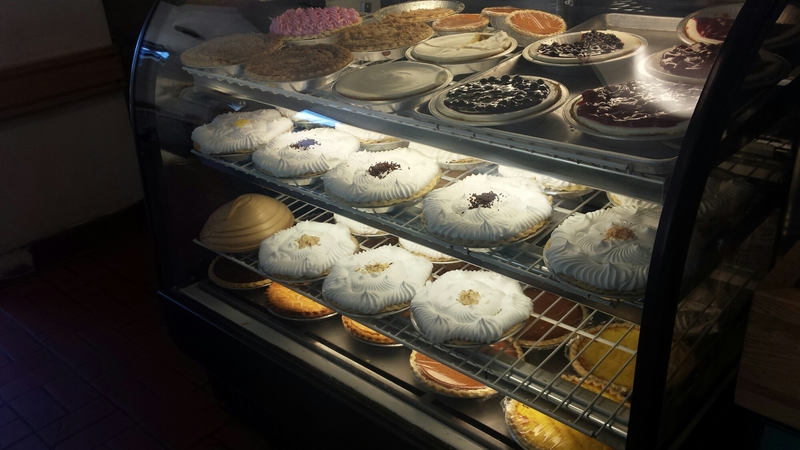 One thing I would also like to mention is the pies that they have freshly made. I have never tried the pies because I am usually too stuffed to ever think about getting a slice so if you have tried the pies then please comment on the blog and let us all know how they are. If you have never experienced Nation’s then my suggestion is to try it out on a weekend first. Take your kids or go with family. Don’t rush the meal, sit down, talk, make a memory there. I have tasted burgers from tons of places and in taste I can tell you a few that may taste better but let me say that NO Burger Joint, No Pub, No Diner, No Lounge ever gives me the emotional satisfaction and a delicious meal completeness at the same time like Nations does. Good job Nations! Thanks for the memories! < Previous Top-Tier Food Truck Tuesday’s!!! Next > My Oh My… He love the Pad Thai! !